It is difficult to create a unique luxury bar inside a New York hotel. Almost every major property from the Thompson to the Maritime to the W to the Empire to the Chatwal offers high end libations. Many of them offer food, either in the gastro pub style or full restaurants in their own right. They compete heavily with each other for special events, celebrity DJ’s and an A-list reputation. Newcomer Salon Millesime could draw crowds away from the older venues and become the venue of the moment…at least for a season or two. The venue sits on a fairly quiet stretch of Madison Avenue, a few blocks from Madison Square Park and one block west from the strip of Park Avenue South dominated by Haru, and Smith and Wollensky’s. Like most hotel venues, the entrance can seem exclusive and intimidating to the casual patron, but the staff is friendly enough to take the edge off. The first bar room is a bit underwhelming, reminding you more of a neighborhood pub than a true lounge. When the room opens up into the main space, the impact is much more impressive. Dark wood paneling, high ceilings and leather furniture rest on the ground floor. A winding staircase leads you up to the balcony where the salon will eventually host corporate events, fashion shows and the inevitable VIP party. Music is also a big part of the Salon’s plan. 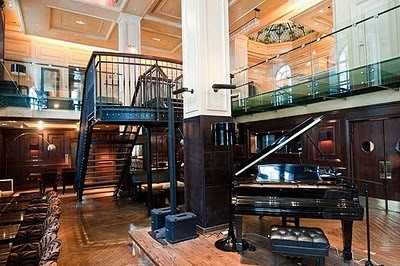 A raised stage sits in the center of the main room dominated by a huge Steinway piano. While the image might appear stuffy at first, this is also the spot where the DJ sets up and the area where high energy artists like Tito Puente Jr. have already played. The night I showed up, the music was a combination of smooth funk and R&B, not at all what you might expect considering the surroundings. From what I understand, the venue will have live music or a professional DJ or both, every single night. The acoustics of the room blend the conversation and music well so you don’t have to whisper in your date’s ear unless you really want to get that close. Because the hotel lounge market is so competitive now, the hotel isn’t entrusting the success of this space to novices. The manager is a long time veteran of successful spaces like Lotus. The menu is overseen by a two star Michelin chef. The DJ’s are pulled from venues like Tillman’s and Hudson Terrace and the rest of the staff seems equally professional. Experienced operators don’t guarantee the success of any space in New York City, but if the Salon does fail, it won’t be from a lack of talent. But hotel lounges like the Salon aren’t for every type of patron. Prices are comparable to venues like Underbar, Plunge and Lambs Club so a glass of wine could set you back $20. It is a space primarily for impressing, mingling, nibbling, wheeling and dealing. Don’t bring anyone here unless you really like them, or you really want them to like you. Salon Millesime doesn’t offer new concepts in the hotel bar formula, but it does well in providing what you expect from this experience. If you’ve already done most of the other hotel bars in the City, add this spot to your arsenal. If you want to celebrate your new record deal, impress your clients from out of town, make a marriage proposal or throw a party that someone else is going to pay for Salon Millesime can take very good care of you.